January 2011: Many parts of North Carolina were covered with sow and ice. A call came in about two registered Quarter Horses in Alexander County that desperately needed to be removed from a starvation situation. But the roads were covered with ice and snow, it would not be safe to transport the horses. Compounding the direness of the situation, one of the mares was reported to have terrible diarrhea which can be life threatening to horses. The caller was willing to pick up everything needed for the horses and deliver instructions to the person in possession of the horses. The two mares had to be cared for until the roads were safe and the horses could be moved to the sanctuary. Time clicks by in slow motion when I know there are horses in trouble and we cannot get them out. Finally, we received a call that a trailer had been secured and the horses would be transported to the sanctuary on January 15th. I am always thrilled how people will step up to help when horses are in trouble. Another kind couple had stepped up to help and the horses traveled the many hours in style with warm blankets. The horses arrived with registration papers, so that evening I called the gentleman who was listed as the previous owner. It had become impossible for him to cotinue caring for all his horses and was now 77-years-old and living in a retirement home. He had owned the mares since they were two years old and loved them dearly. Both horses had been shown in halter classes for years when they were younger and had placed very well, including Hopi (a granddaughter of Impressive) who often placed first. 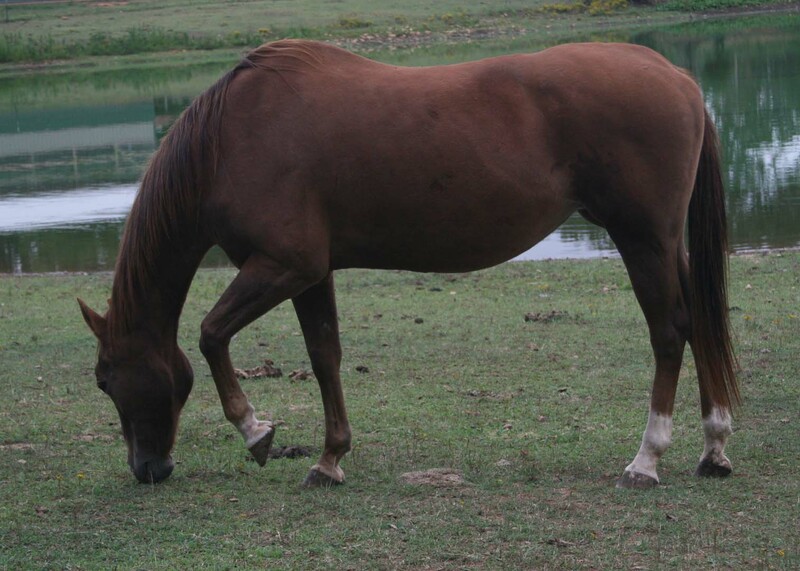 Over the years, Hopi and Sunrise produced a total of 16-17 foals between them. He was thrilled to hear from HPS and it brought the gentleman to tears to know that his beloved mares were now safe and cared for once again. The gentleman had given Hopi and Sunrise away to a husband a wife who had a nice piece of property before moving to the retirement home in the summer of 2009. Only the wife had any knowledge of horses. Later the couple separated and the husband was left with the horses. Hopi's and Sunrise's health quickly deteriorated. 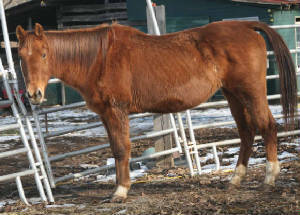 In December 2010, the husband gave the horses to the person from whom we received them. Hopi is now 28 years old and a descendant of the famous sire, Impressive. She has had no training other that what was needed for halter class shows. She was in better condition than Sunrise upon arriving at the sanctuary and scored a level 3 on the Hennecke scale. Hopi's and Sunrise's story has a happy ending because they were rescued before their condition became too dire. Typically horses such as these bounce from one wretched situation to another for years. Both mares are available for placement as pasture pals to a person that doesn't want to ride either or as a companion for another horse.